Indoor positioning & analytics capabilities have been getting attention by venues and businesses. The technology had just evolved since 2013 when several Wifi brands (eg. Cisco, Aruba, Ruckus, Motorola, etc) started to launch their RTLS (Real-time Location Server). This gives rise to the possibility for indoor location based services and analytic. This is a new business ground with the newly available technology. TechStudio is honored to be invited to involved in several projects initiative that surrounds this technology and allows the company to derive a product suite that allows business to bring ROI from their Wifi investment. Offering Wifi access is becoming popular and necessary for venue owners such as a mall, retail, and restaurants. TechStudio sees the opportunity to convert this “cost spending” infrastructure into a “value added” solution to the business through advertisement, loyalty and business analytic enabling. Provide impressive WiFi access experience. Obtain in-depth analysis on venues and customers to optimize business processes and operations. Acquire new capabilities in developing and deploying innovative and accurate LBS. Enable new channels to engage consumers. Generate insights to consumers behavior enabling new lines of targeted promotion. User-friendly experience in obtaining WiFi access. 1. Wifi Captive Portal Platform: An AAA (Authentication, Authorization, Accounting) solution for enhancing the experience of signing up for Wifi services as well as to present marketing and advertising contents. It also provides a channel for subscribers acquisition to facilitate marketing and analytic. 2. Indoor Navigation Engine: An artificial intelligent platform for generating the optimal routing paths between a location within the venue. The platform also includes feature to enable turn-by-turn navigation by providing details on the turning and POI (point of interest) around. 3. Indoor Location Service Delivery Platform: This middleware product encapsulates the complexity of integrating with the Wifi infrastructure by different brands (eg. Cisco, Aruba, Ruckus, etc) and expose a unified set of capabilities for implementation of different services by ICT companies. The platform mediates between the infrastructure and service providers, perform data collection, processing, and storage. This allows service providers to focus on designing and implementing the service without being brought down the details of how to leverage on the location information. 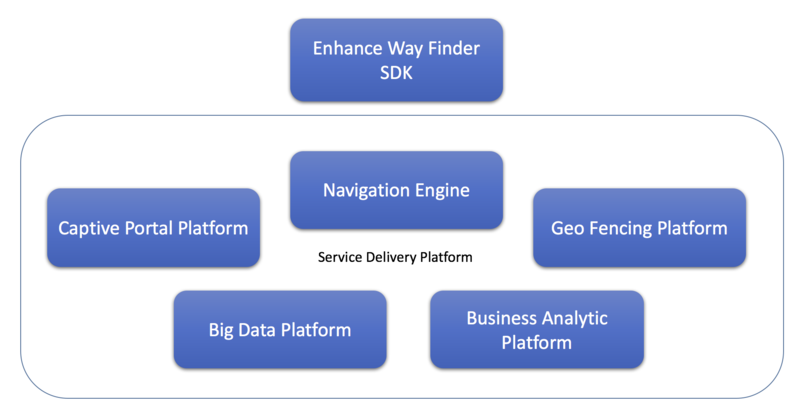 Other than Wifi data, the platform is also the capability to scale up to support another form of data sources, including iBeacon, GPS, Radius, etc. 4. Indoor Way Finder Platform: Leveraging on (b) & (c), the company designed and developed an indoor way finding the platform that allows venue to quickly launch way finding services on the mobile application. With the experience gained from the challenges faced by the industry to achieve accurate & timely location, the platform had incorporated advance positioning algorithm with the aid of the smart devices’ sensor to greatly improve the user experience. 5. Business Analytic Platform: One of the most valuable assets gained with both Wifi & indoor location deployment is the business information that venue can obtain to improve their insight. Thus the platform consolidates the data from various channels (eg. Wifi Infrastructure, Captive Portal, Location Server, etc) to provide a suite of analytic reports that enable the venue to gain in-depth analysis on the venues and customers. 6. Geo Fencing Platform: Being able to deliver timely information to potential customers at the correct location is a dream of most marketers. Geo Fencing Notification enables this dream to come true by automatically delivery pre-defined marketing information to the consumer through push notification when they are within the specific vicinity.